May, A, Brandt, B.W, El-Kebir, M, Klau, G.W, Zaura, E, Crielaard, W, … Abeln, S. (2015). 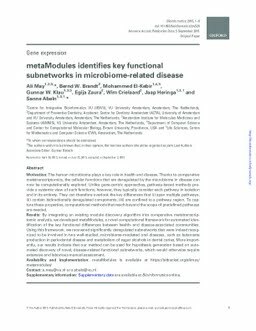 metaModules identifies key functional subnetworks in microbiome-related disease. Bioinformatics, 1–8.